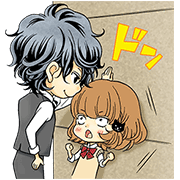 http://www.line-stickers.com/ – Kin Kyori Renai Line Sticker | Hand-drawn by Mikimoto Sensei himself! “Kin Kyori Renai” (Short Distance Relationship), the popular manga that got its own movie, now has its own stamps! Download any “Kin Kyori Renai” volume from LINE Manga to get the set for free!